The great Serengeti highway: 5 options, 1 solution and 5 core value-principles needed now! 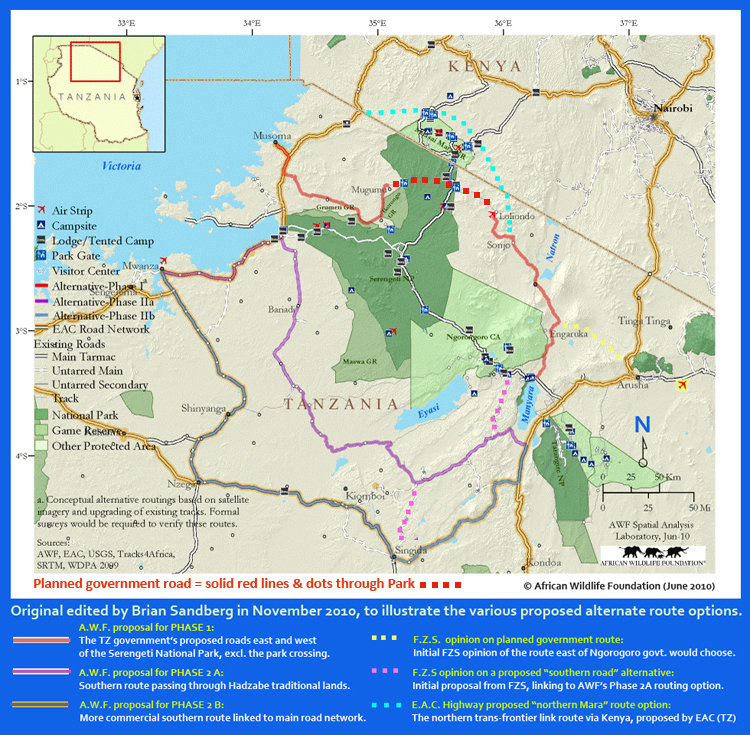 The Tanzanian elections are over and now the hard work begins to SAVE our beloved, and iconic, SERENGETI from commercial road infrastructure development. I am making an appeal here today for the East African Development Bank (EADB) to take a new, dynamic position in strategic lead-funding arrangements for any major road infrastructure development in Tanzania, in order to achieve a united regional and global vision of zero development within this pristine biosphere. 7. Support groups of concerned citizens, from inside Tanzania (including communities affected by conservation development programmes) and Kenya, plus fellow Africans and those beyond our treasured continent. WHY THE ‘EAST AFRICAN DEVELOPMENT BANK’ INVOLVEMENT ? E. The EADB is obliged by its Charter to be fair, transparent and inclusive in the source and application of infrastructure loan funding. 5. EAC HIGHWAYS OFF MIGRATION lobby group on Facebook. Each one of these parties brings some position to the table and certain merits can be found to a greater or lesser degree in their respective proposals. However – there is one common thread to the Tanzanian government’s proposal and that is there must be NO commercial road development through the iconic Serengeti. This is extensively supported by local, regional and international opinion, across a range of professional and specialist advisers, as well as media commentators and ordinary men and women of good social conscience. I believe there can only be one over-arching solution and it must be created and developed by consensus through a specialist institution with in-depth experience and insight into major infrastructural funding for regions and nations. I would propose a simple acronym for the 5 core-value principles I seek to promote in this appeal here, taking the region’s rich bio-diversity into account. Allegations have been made inside Tanzania (as well as in Kenya and beyond) that the government has not been transparent with its citizens and related-party stakeholders in this project matter, either in the nature and source of infrastructure funding, or in the pending Environmental Impact Assessment report. A credible intermediary, such as the EADB, will address this considered lack of transparency. (b) A national, regional and global responsibility for environmental protection. Again – a specialized, regional infrastructure funding institution will ensure absolute equality of key interests in any final outcome. Given the highly sensitive nature of this essential regional road network development, coupled with an extensive range of local and international interests, any leading-finance arrangement facilitator must be able to stand the “litmus test” of international accountability. The EADB has a pre-eminent track record. There are allegations and counter-allegations that not all affected communities have been properly consulted in either the government’s proposal, or certain other alternate solutions. It is an undisputed fact that the peoples of the Serengeti region surrendered much of their traditional pastoral and traditional home lands for the greater good of environmental conservation. Certain issues have now become a political football in the region and so it is clear that there needs to be widespread, qualitative and independent communal engagements, led by a credible research agency. The EADB has this capacity, which can be scaled up specifically for this task. As a World Heritage Site, the Serengeti National Park occupies a unique role within the Tanzanian society and economy, coupled with that of Kenya and its related Mara biosphere, since they together form an indivisible, globally-sensitive eco-system. Given this overwhelming obligation for preservation for the future of human- and nature-kind on this earth, the EADB also is exceptionally well-placed to factor such a key objective into any over-arching end-solution. I am calling here for ALL interested parties, inside Tanzania and beyond, to approach the East African Development Bank to appeal for this institution to take a lead role in facilitating responsible socio-economic road infrastructure development in north-western Tanzania. The EADB is head-quartered in Kampala (Uganda) and has regional offices in Dar es Salaam (Tanzania) and Nairobi (Kenya).